"Theatre of the Estates", built in the 18th century. 1829, 1845 restorations. Destroyed by fire on 17 Feb 1887. 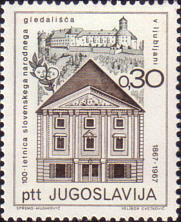 Text: "100-letnica slovenskega narodnega gledalisca v ljubljani - 1867-1967"